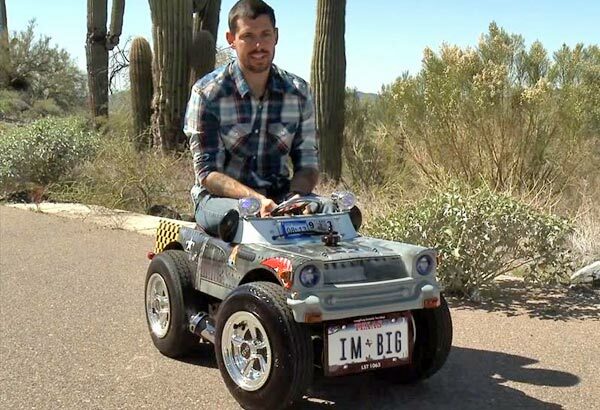 Austin Coulson, Phoenix native, and the designer and creator of this little 'toy', has the new Guinness record for the world's smallest roadworthy car. Lisa Stoll proving that the world's smallest road-legal car is faster than rading on skateboard. Although it looks like more a battery powered ride-on car for kids, it is not exactly a toy. The cutemobile can reach a top speed of 33 mph, but it feel like you are going at 100mph, said Coulson. The cutemobile can reach a top speed of 33 mph, but it feel like you are going at 100mph, said Coulson. 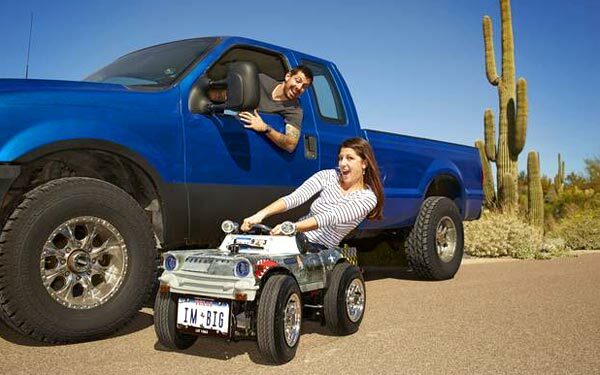 The Guinness World Record has just revealed the new holder of the title "World's Smallest Car" for driving legally on the streets. It is a vehicle that was designed to simulate a Chevrolet from 1957. It has a length of 49.75 inches (1.26 meters), a width of 24.75" (0.63 m) and has a high of 25" (0.64 m). It has a half gallon tank (1.89 liters) and reaches a top speed of 33 mph (53 Km/h). 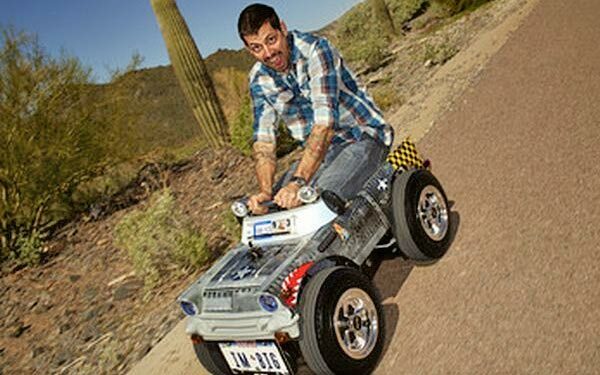 The creator of this tiny car is Austin Coulson, a Texas resident, orginally from Phoenix. The Cutemobile, how he named its tiny crossover, is based on an ATV (All Terrain Vehicle), but enormously modified to meet the requirements of a vehicle to be legally driven on the streets. 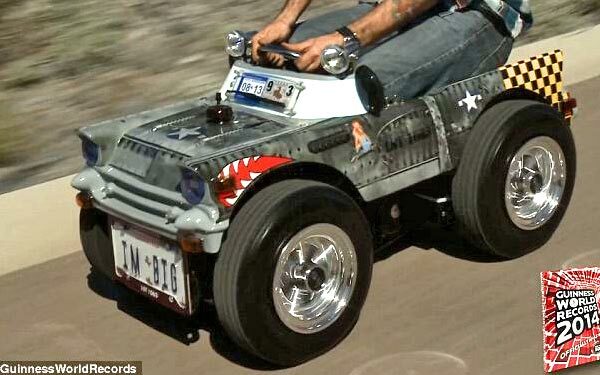 This miniature car is completely drivable and is registered in the state of Texas. To obtain legal recognition both state and federal, according to Coulson, certain requirements had to be met such as including headlights and turn signals, windshield, wiper, seat belts and even a horn. It sounds strange and funny, but so it is. Video: Watch how the car looks like on the street and how Austin Coulson, its creator, made to achieve his goal. Worth mentioning that the vehicle can only circulate on streets where the speed limit is 25 mph (40 km/h), so you'll never see it on the main streets or highways. Austin Coulson said that although the vehicle is relatively slow and only reaches a top speed of 33 mpg, it really feels like you are going at 100 mph. When he told to his family that he wanted to break to smallest roadworthy world's record, was going to try and get the world record for the smallest roadworthy car, they were not easily convinced and had doubts about his purpose. Sometimes, Coulson is invited to participate with its controversial vehicle in local veterans and military parades. This new Guinness World Record is ready to be listed in the next book for 2014. We hope you have checked the whole photo gallery as well as the video of this curious and ingenious cute car.